Webster’s Dictionary defines flexible as “Willing or disposed to yield; pliable”. 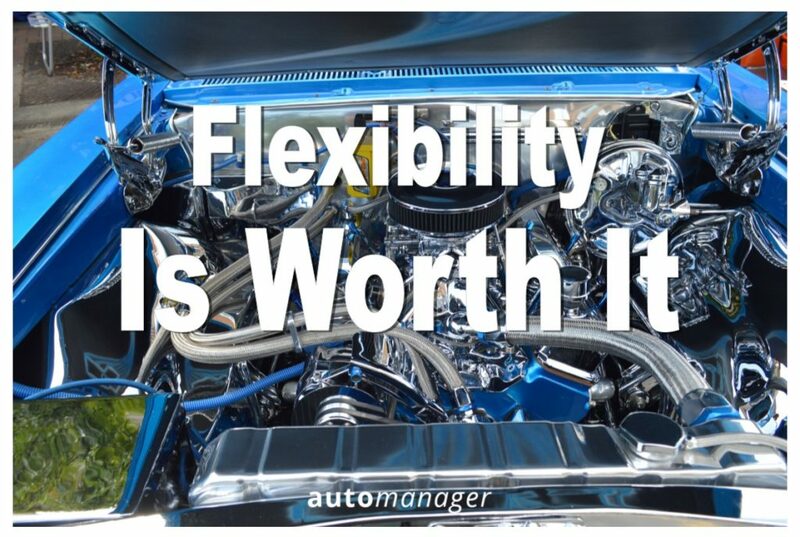 For a used car dealer, just like any other business, sometimes people can misunderstand what being flexible really means. As an independent used car dealer, it does not mean that you shouldn’t have a point of view. Nor does it mean there should be no process in place. It certainly does not mean to negate your desire to always be improving in all areas of your business. Which most definitely may include revenue, increasing the size of your business, as well as improving the quality and amount of your online reviews. What the word “flexible” really means, is don’t be so set on something, that you can’t see the forest for the trees. Have you ever noticed when someone says that they are a perfectionist, it really means they have a hard time letting go? So, when they see a detail that is imperfect, it makes everything else around it flawed. The inability to be able to yield or shift your focus, is not the best way to make friends and influence people. Having an ability to yield, however; the ability to be both detail oriented, and accommodating the nature of the person you are selling to, as well as the moment you are in, is really what being flexible is all about. It’s not all or nothing thinking and action. It does not mean, as a used car dealer, “do the exact thing next time that you did this time”. Rather, it gives you added insight, which will allow experience and the willingness to be aware, help smooth the way for the next success. If you apply this principle to selling used cars, trucks, SUV’s, a crossover, a boat, a motorcycle, or even a used plane, will yield more opportunity to take you to the next level. No one person is the same, and so no one delivery can be the same. It is reasonable to see and state that you may observe multiple similarities between customers and situations. This is valuable and relevant. Ironically, it will help to know that being flexible, even when you see these similarities, in real-time, and with real customers, will keep your thinking agile rather than, “same old same old”. “Same old same old” can be a liability to thinking on your feet. Here is something you may already practice. As you know, in all sales, there is the element of “making friends” with the customer. That entails making a connection, being friendly and likable. It also includes being engaging and showing interest in what is happening. To be both a thought leader, a teacher, as well as impart a sense that you are on their team. There is a social flexibility that goes along with this. What you say to one person may not fly with another. Acknowledging people, in any type of sales, without dismissing their point of view, is very important. Flexibility and being open-minded creates further understanding, and further understanding creates connection. As a used car dealer, you may want to apply this thinking when you train your sales people. It is a given that there is a process you have, and it works. Therefore, we can assume it is there for a reason, right? Without taking anything away from that reason, just add another shade of gray; add pliability to the equation. Pliability can be a two way street. It means, that if you choose to instruct your salespeople in the art of being pliable (flexible), then that that will actually help make the customer be more “pliable”. A “pliable” customer is more likely to buy, whereas an unyielding customer may not. This may sound like a no brainer, but it can be really hard for almost anyone, to bend and be flexible, especially when you have seen success. Not every day is a day that requires a large amount of flexibility. This is just another tool to add to your tool chest. The ability to view details and their impact on your environment and not let them get in the way of a sale.